When working with ViArt Shop you have all the possibilities to make your online store one and only. You can change the feel and look of your site, select different templates and change color schemes. Another great feature is that you have the ability to edit the messages your customers see while surfing your site without the necessity to edit any files*. 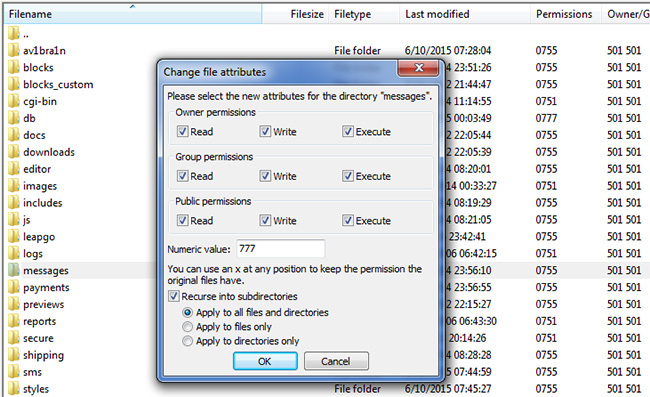 *Note, the /messages folder on your FTP must have writable permissions '777'.Read more. In order to edit a message you have to select a language (in case it differs from the default one) and locate in through the sections. Should you have any difficulties, you can use the search field in the upper right corner of the page. Click the corresponding 'Edit' link and enter a desirable word or phrase into the Message text box. Note: You can add new messages as well by clicking the 'Add New' link (above the 'Edit' links). 2. Find the folder "messages"
After doing this you can edit the static messages via Admin panel. Please remember to make a backup of the messages folder before next upgrade or otherwise all your changed messages will be lost.